The perfect addition to any night time rental. These 30″ diameter highboy tables add the perfect ambiance to your party. 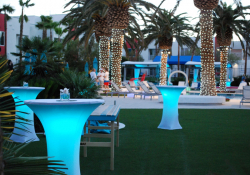 Whether they are under one of our tent rentals, or surrounding a pool or bar, these tables give your party the wow factor you have been looking for. Select from 20 colors which an be changed by remote control, or have random fading colors. Battery will last up to 10 hours.